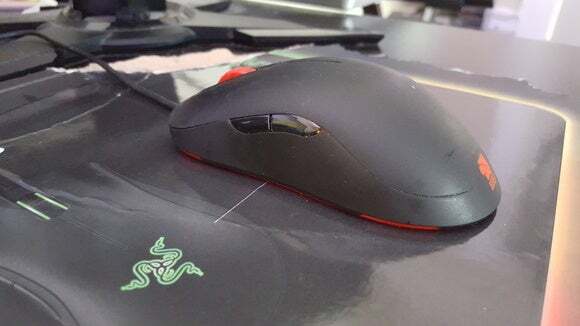 Razer built a better mousepad--for Razer faithful, anyway. The Razer Firefly has me thinking about the role of the mousepad in modern computing. Why do we use mousepads? The Razer Firefly: The Razer Firefly is easy enough to pull out of the box and slap on your desk. And if this were a normal mousepad, you’d be done. 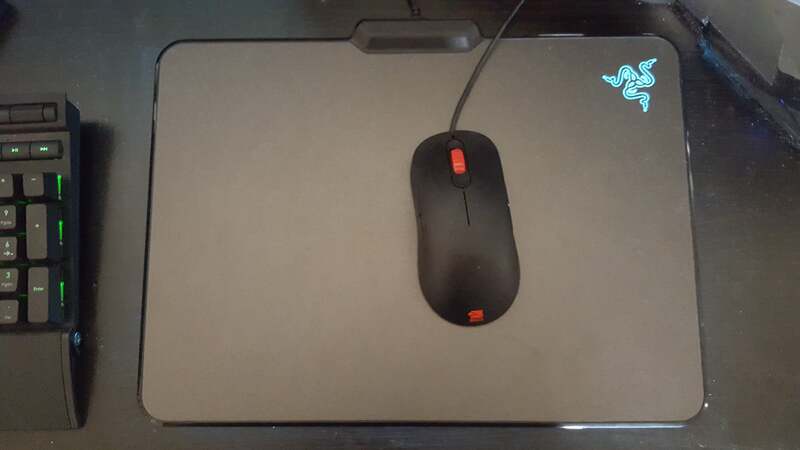 But the Razer Firefly is no normal mousepad. It demands power, in the form of a six-foot USB cable sticking out the rear. This necessitated my routing the cable behind my desk, crawling underneath, and trying to find a free USB slot—a harder task than you might think, considering the number of peripherals I have plugged into my computer. Piece of Cardboard: This was much easier. Even with muscles atrophied by years of video games I managed to rip a hunk of cardboard off the Firefly’s box and put it on my desk. No wires necessary. Step 1: Tear off cardboard flap. Step 2: Put it on desk. I did end up taping the edges down at some point because the cardboard kept moving around, but that also didn’t take much time or effort. Advantage—Piece of Cardboard: While taping the piece of cardboard to my desk was a bit of a hassle, at no point in the process did I need to bend over or crawl under a desk. Also, it doesn’t take up one of my precious USB slots. The Razer Firefly: The Firefly looks pretty much like a standard matte-black mousepad—a 14-inch by 10-inch rectangle of hard plastic, with the Razer logo in the top-right corner. Oh yeah, and a big honking piece of plastic welded to the top where the USB cable exits. Piece of Cardboard: “Hobo chic” is how I would describe this piece of cardboard, if I were desperate to explain to someone why I’d taped a piece of cardboard to my desk. I am not that desperate, so I feel comfortable saying it looks like trash. Which it is. I literally taped trash to my desk. 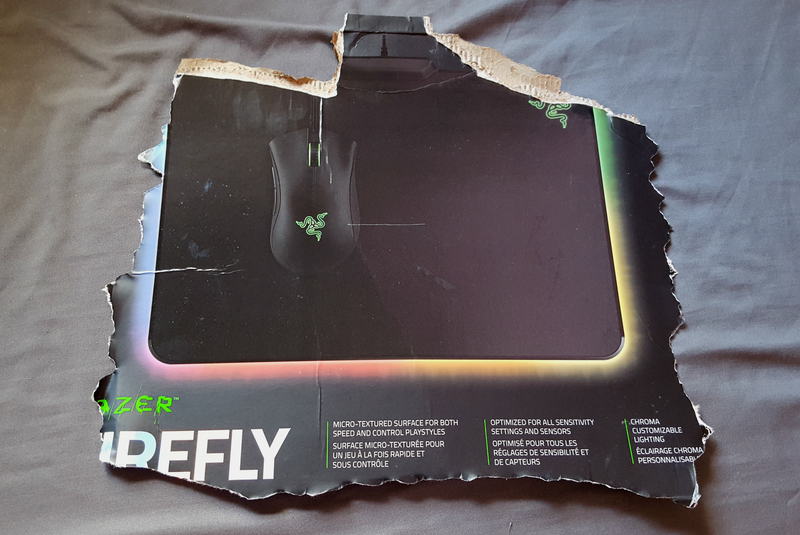 This is my modded Razer Firefly - Cardboard Edition. Advantage—Razer Firefly: The Firefly wins this one by default. It looks pretty good even unplugged, though its rigid structure means I can't roll it up when not in use (like a normal mousepad). The Razer Firefly: As I mentioned, the Firefly has a cable fastened into the top. There is no way to detach the cable. This is frustrating for a few reasons. 1) The cable on the mousepad occasionally tangles with the cable on the mouse and screws up your nice, fluid movements. 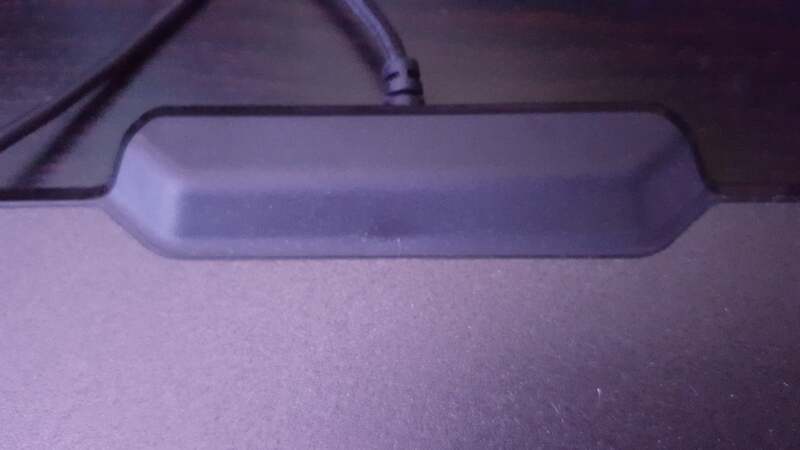 2) The mousepad is essentially immobile, because you’re never going to bother unplugging this thing from your computer to move it to a new computer or take it on the road with you. 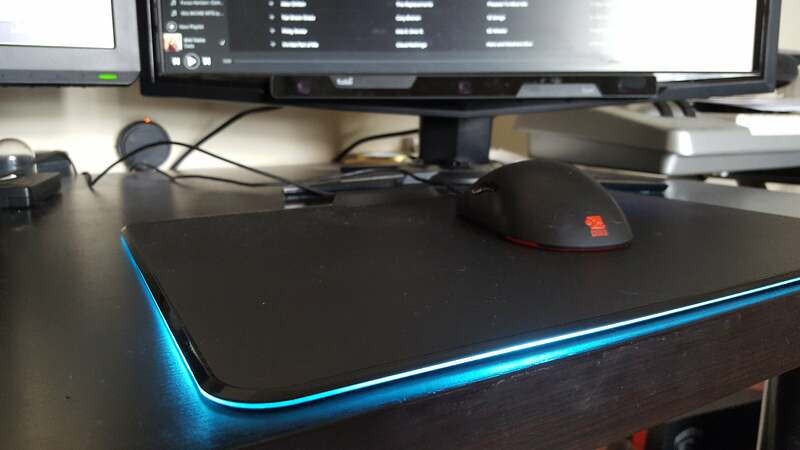 3) If the cable breaks, your gorgeous light-up mousepad is now just a normal mousepad. Joke’s on you. Piece of Cardboard: It doesn’t have any cables. Advantage—Piece of Cardboard: I already have a million cables attached to my desktop. The fewer, the better. 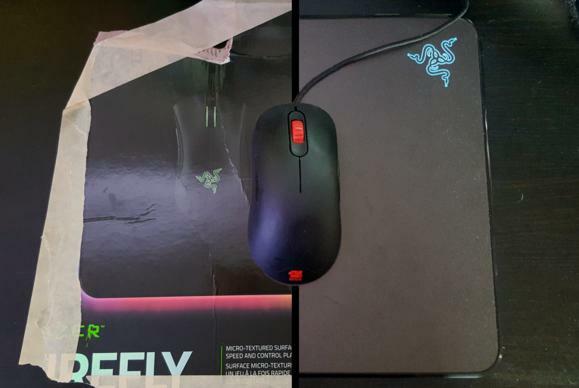 The Razer Firefly: Aside from the cable’s occasional interference with your mouse cable, the Firefly is a damn good mousepad. And by that, I mean I’m 90 percent sure this is the same surface Razer uses in its $40 Razer Destructor 2 mat. I’ve never used the Destructor 2, but I eyeballed Razer’s product photos and it seems the same. My Zowie AM mouse glides across this thing no problem. 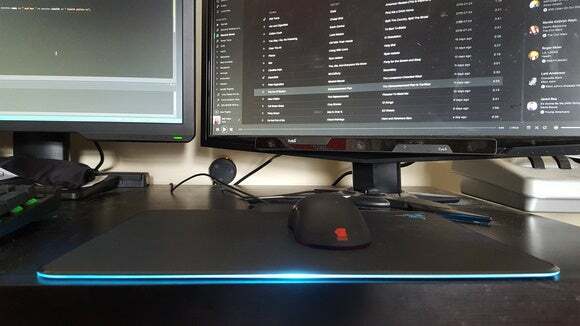 But honestly my Zowie AM mouse also glides across Zowie’s $30 G-TF mousepad, glides (with a bit more effort) across a cheap cloth mousepad I got from VistaPrint, and even glides across my wooden IKEA desk. Piece of Cardboard: Oh, and my Zowie AM glides across the piece of cardboard too. 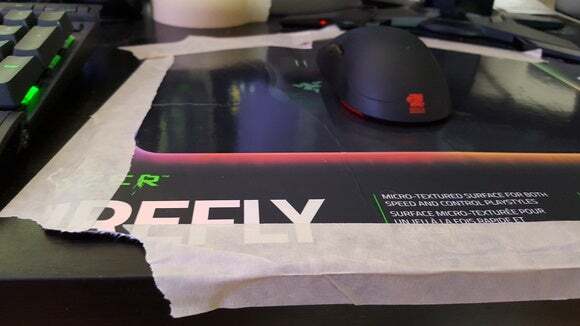 If I let go of the mouse while moving, it definitely comes to a stop on the cardboard quicker than it does on the Firefly. This piece of cardboard is no precision-engineered low-friction surface. But it does its job. Advantage—Razer Firefly (Barely): I’m not going to bother pretending the cardboard is as slick as the Firefly’s surface. Moving a mouse over the Firefly is nigh effortless. On the other hand, you’re unlikely to notice the difference unless you’re a low-DPI-and-large-hand-movements person. As a high-DPI user I’m not in the habit of making large sweeping motions across my mousepad, so any old surface works perfectly fine for inch-to-the-left-inch-to-the-right usage. Of course, if you are a low-DPI user you’re also a prime candidate for snagging your mouse cable on the Firefly’s cable or cable housing. Win some, lose some. And to be honest, I noticed even less of a difference in glide performance once I switched to using Razer’s own DeathAdder mouse. My Zowie AM is lightweight and built for quick movements. 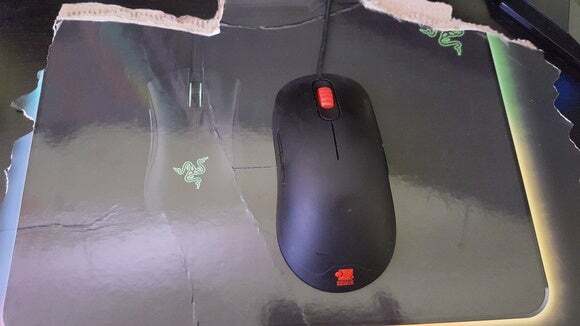 The heavier DeathAdder took some effort to move both on the Firefly and on the cardboard. The Razer Firefly: The Firefly’s lighting effects are bit more understated than Razer’s promo shots made it seem. The Razer logo in the top-right lights up, as does a strip of LEDs around the left, front, and right of the mousepad. And I should be clear—the side lighting is on the facing edge, not on the top. You actually barely notice the lights when you’re sitting up close to the mousepad. It’s more stylish from far away. It’s also single-zone lighting, meaning you can’t have a different color for the logo and the sides, or different parts of the sides. It also means you can’t turn off a part of the lighting, so if you want the sides to light up you’re forced to light the logo also. 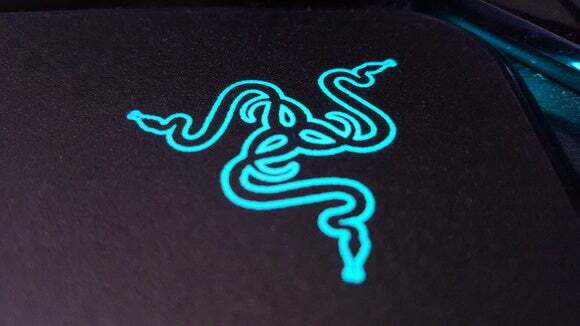 Zone one lighting means Razer’s tri-snake monster thing is always staring at you. Colors are vibrant, but accuracy is middling when using Razer’s Synapse software to configure. I’ve had greens register as a brilliant shade of turquoise on the Firefly, for instance, and it’s sometimes hard to tell if you’ve made any difference at all when switching between similar hues. Like other Chroma devices, you get Razer’s standard effect presets—breathing, spectrum cycling, static, and wave. Piece of Cardboard: There are no lights. It is a piece of cardboard. On the other hand, you could buy one of these rolls of LEDs off Amazon and stick it to the cardboard if you so desired. You could even use the LEDs to tape the cardboard to your desk instead of using cheap masking tape like me. Advantage—Razer Firefly: I mean, I assume you’re buying the Firefly because it has pretty lights. The cardboard (surprise!) doesn’t have lights on it. The Razer Firefly: The Firefly does include one special “Reactive” lighting mode that only functions if you have a compatible Razer mouse plugged in. In this mode, the Firefly’s lighting flares on whenever you click. It’s by far the coolest effect on the Firefly, but you’ll need to be all-in on Razer’s ecosystem to take advantage. Piece of Cardboard: …Still doesn’t have lights. Advantage—Tie: It’s cool this mode exists, but the fact it’s restricted to people who own both the Firefly and a compatible Razer mouse means the potential market is pretty small. And for everyone else, the Firefly is pretty much on a par with the piece of cardboard. The Razer Firefly: Holy hot damn, for a second I almost forgot the Razer Firefly costs a whopping sixty dollars. Yes, a sixty-dollar mousepad. Piece of Cardboard: I guess technically this cardboard also cost sixty dollars, considering I tore it off the Firefly’s box. However, I feel confident you could use pretty much any old piece of cardboard lying around your house with similar results. You could even print this article out on paper, tape it to your desk, and use this article as a mousepad. Advantage—Razer (The Company): You know what? If Razer can convince you to spend sixty dollars on a mousepad, more power to them. Personally I think it’s silly. Does the Firefly look cool? Sure. Does it function as a mousepad? Yes. Does it light up? Without a doubt. Razer is not misrepresenting the product it has made. But I cannot fathom a world in which I’d choose to spend sixty dollars on this. The Firefly is better than a piece of cardboard, but it’s not sixty dollars better. There are plenty of other PC upgrades I could make for that money—or plenty of games I could add to my Steam library, for that matter. And sure, maybe you don’t want to look like a weirdo with a piece of cardboard taped to your desk. Fair enough. There are cheaper mousepads, though—some of which look just as nice (in my opinion) as what Razer’s got here. Or you can use a site that lets you create your own custom mousepad! The possibilities are literally endless. Primary image chop-job courtesy of me, the Samsung Galaxy S6, and five minutes in Pixlr. The box the Razer Firefly came in might not light up, but it'll serve as a mousepad in a pinch. You can put a mouse on it. It is a mousepad. The Firefly is a light-up mousepad. And it's $60. That's all you really need to know to decide whether you think it's amazing or insanity. Functions slightly better than cardboard. Costs as much as Fallout 4.